The soundboard painting on this instrument is a faithful recreation of the original from 1624. It is painted with gouache, and I chose to use only the pigments which were available in Flanders and the Netherlands during the early part of the 17th century. Many of these cannot be purchased as ready-made paints, so I made most of the paints myself using recipes from the period. For example, for white I used oxide of lead, mixed with gum arabic, glycerin, water and a few drops of oxgall. Some of the other pigments are finely ground minerals and semi-precious stones. For the exterior of the case I chose a typical early 17th century style which is a stylized version of metal strapwork. The inside of the lid is painted with a simple red-on-red diaper pattern covered by a highly reflective glaze which reflects the soundboard painting when the lid is open. 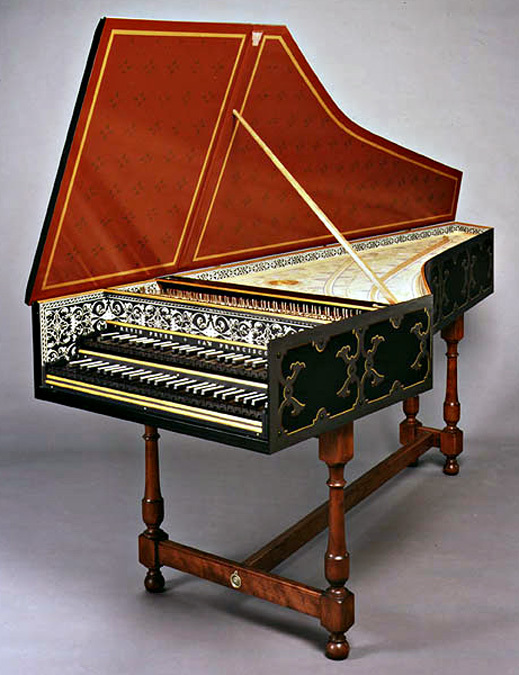 The black and white designs which surround the keywell and the soundboard are block-printed papers, the same technique used to decorate the original 17th century instruments, a practice that began as an inexpensive imitation of the marquetry then popular in Italy. I carved the designs into pieces of pearwood, which then were inked, a sheet of paper laid on top, and rolled through a press. After drying, they are glued into place with wheat paste.